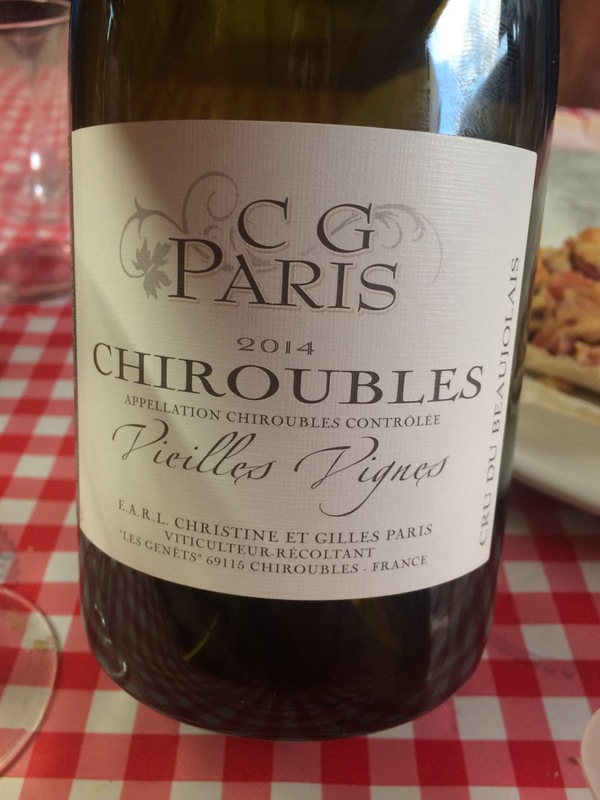 I harvested a few days with Chiroubles-based natural winemaker Gilles Paris back in 2015. It was a disorienting experience. It was the hottest weekend of a heat-wave year, which did no favors for the ambience inside Paris' windowless white transport vans. I also could rarely discern whose vines we were in. In each new parcel I'd ask, "Are these your vines?" and Paris, shaking his head, would inform me they were those of a neighbor who sold to the cave cooperative, or that they belonged instead to his brother Jérôme, who was absent. Paris, it seemed, led a team he rented out to other growers before harvesting his own parcels. In the end I had to depart before setting foot in Paris' vines. 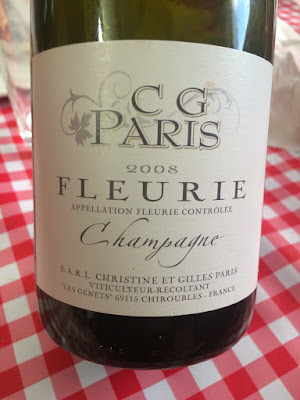 Over dinner during harvest, and throughout innumerable apéro-hours after, I pestered Paris for a tasting at his cuvage. He kept demurring, citing his workload as then-President of the Beaujolais Interprofession. The fact that he and I continually ran into each other while out drinking proved this to be a rather thin excuse. We grew friendly, even as I withheld forming an opinion on his wines, for simple lack of information on them. 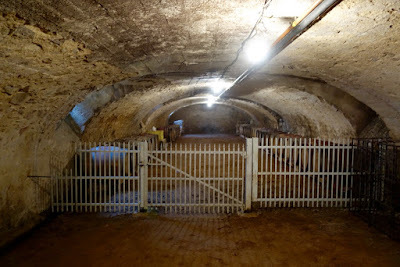 It was only over two years later, touring Paris' new winery in Fleurie this past February, that I finally confirmed where he'd been vinifying, and where Jérome Paris had been all this time. 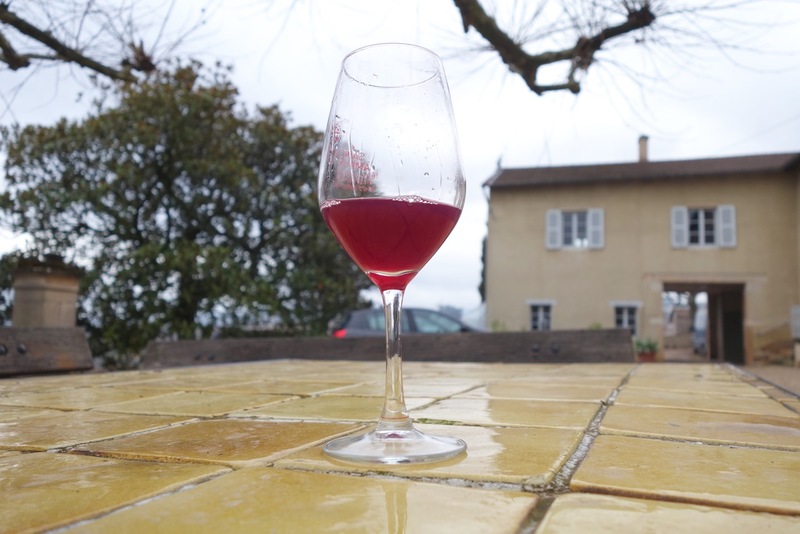 That the details of Paris' unfiltered, low-sulfur cru Beaujolais wines had become mysterious was, of course, entirely inadvertent. 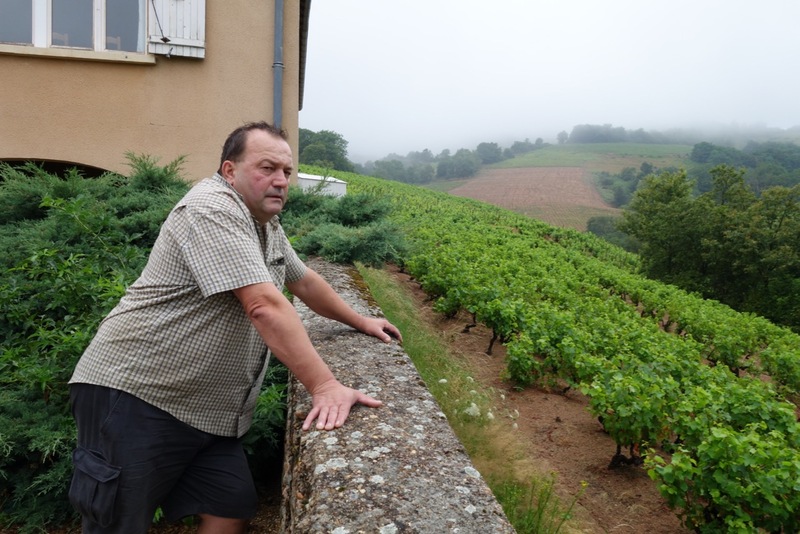 In Paris' mind, he's just being a normal Beaujolais débrouillard, an effective operator, keeping his head down till the work is done. Harvesting outside of Gilles ex-mother-in-law's house, August 2015. Paris is one of five brothers, all of whom work with vines in some way or another. Paris and Jérôme both sell a portion of their grapes and bottle the rest as wine. Their brother Philippe sells entirely to négoçiants and the cave cooperative. Their other brothers Hervé and Christian are vineyard workers for other estates. Originally from Quincié-en-Beaujolais, Paris moved to Chiroubles when he married his ex-wife, Christine, whose family had vines in the cru. He made his first wines in 2005, and soon began to sympathize with the natural vinification principles of the natural winemakers in neighboring Fleurie and Morgon. Following his separation with his wife, Paris found himself without a cuvage of his own for several years, which explains his reticence when I asked to taste from tank. When we met in 2015, he was vinifying chez Le Chat, at the latter's winery in Marcellins. When I tasted with Paris in February 2017, he had only halfway moved in to the new premises in Fleurie. There were a handful of tanks finishing fermentation, and two rows of old wooden barrels in the cellar below. "2016 is the twelfth time that I'm making wine. And it’s the first time that I challenge even those who don’t like natural wine to say that it’s natural wine. There’s no flaws, no volatile, no nothing. I think it’s the first time I've gotten everything together," says Paris, adding, "I said that to someone the other day and they said, 'Yes, it’s because it’s not your grapes!'" Paris' 4.5ha of Chiroubles were hard-hit by the storms of 2016. Nor were his parcels in Morgon and Fleurie spared, as they were situated in the lieux-dit that formed the path of the storm: "Douby," "Grand Pré," and "Champagne." Paris, like his friend and fellow 2016 hail-victim Jean-Louis Dutraive, received a derogation allowing him to purchase fruit to make up for his losses. Where Dutraive purchased a formal négoçiant licenses, however, Paris decided simply to exploit the vintage-specific derogation, purchasing fruit from the same crus he usually produces: Chiroubles, Morgon, and Fleurie. His Chiroubles in 2016 derives from a neighbor with higher-sited, conventionally-farmed parcels that were spared the hail. 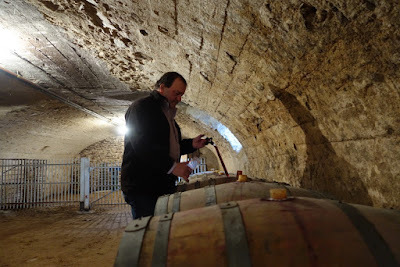 In February it was showing admirably; barrels I tasted shared a chalk mineral note amid their fresh, black-cherry fruit. 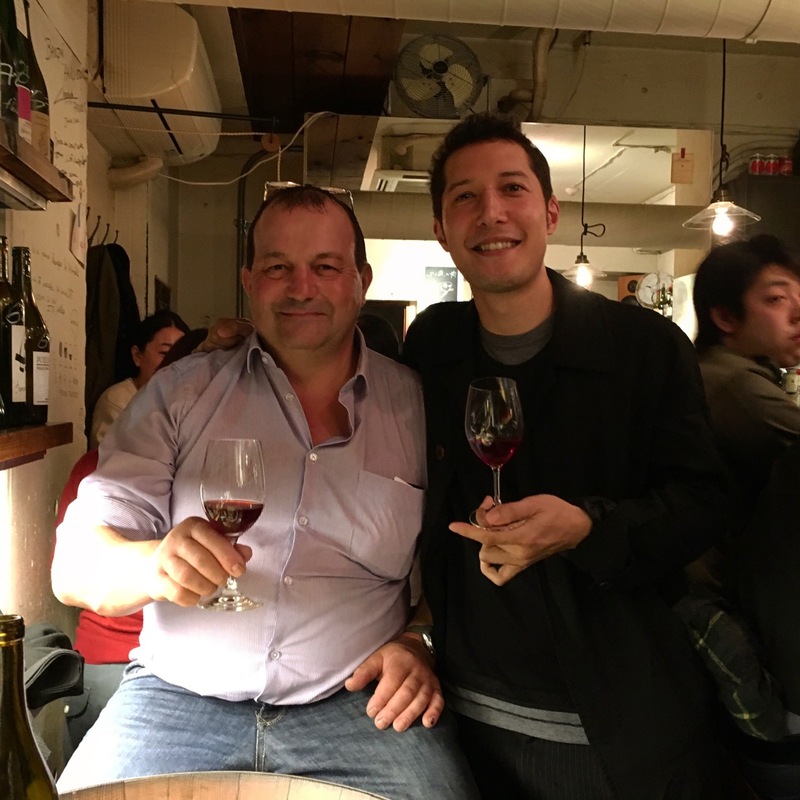 He brought Fleurie fruit in 2016 from some of his close friends in the village. As he himself admits, it's showing better than ever. In the past I've found Paris' lieu-dit "Champagne" a little over-extracted, whereas the heat of the 2015 vintage partly obscured his success in that year's lieu-dit "Grand Pré" cuvée. In 2016, with fruit partly from "La Madone," his Fleurie is lighter on its feet, more dashing. His 2016 Morgon, for its part, derives from the southernmost edge of the appellation, where it meets Brouilly. I'm less familiar with the terroir of this corner, and indeed I had a little trouble recognizing the Morgon I know in the wine. Most fascinating was a small tank of a cuvée Paris intends to call "Le Rescapé," 'the survivor.' It's a tank made from the leftover, hail-ravaged fruit he and his friends arduously collected from his own Chiroubles vines in "Le Fontenelle" and "La Cour Profonde." Grippy and bright, with a lip-smacking greenness to its high-toned, crispy cherry fruit, the wine was, finally, an embodiment of the historical tasting notes one occasionally reads of Chiroubles. Its colour was as lively as it was cloudy. It's also keener than anything Paris has produced before. He practices semi-carbonic maceration without destemming, with moderate vatting, around 15 days for most cuvées in 2016. He doesn't pre-refrigerate the harvest before vatting, instead relying on cooled pumping-over to moderate spikes in temperature. I'd speculate that the coarse, sometimes tannic qualities I've found in previous vintages' wines derive from the frequent recourse to pumping-over. It's tricky to go long on semi-carbo without pre-refrigeration; there is a tendency for the wines to harden. When all goes well, however, it's fascinating to taste these long-macerated, unfiltered, often unsulfured wines, which moreover sidestep the latter-day imaginary brouhaha about cool carbonic maceration. 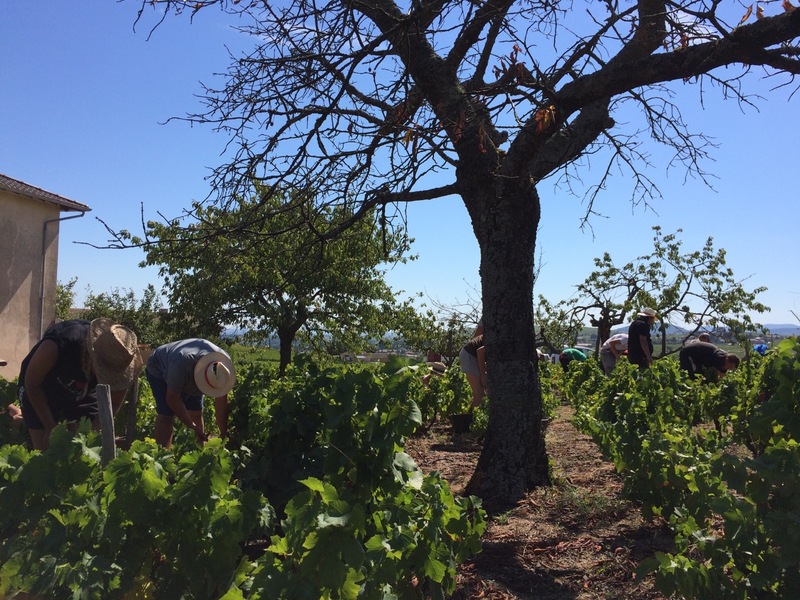 One which sticks in mind from the 2015 vintage was "L'Espérée," a parcel cuvée from north-facing vines which had escaped the worst of the seasons' heat. Its lift and its suave dark fruit set it apart that year. 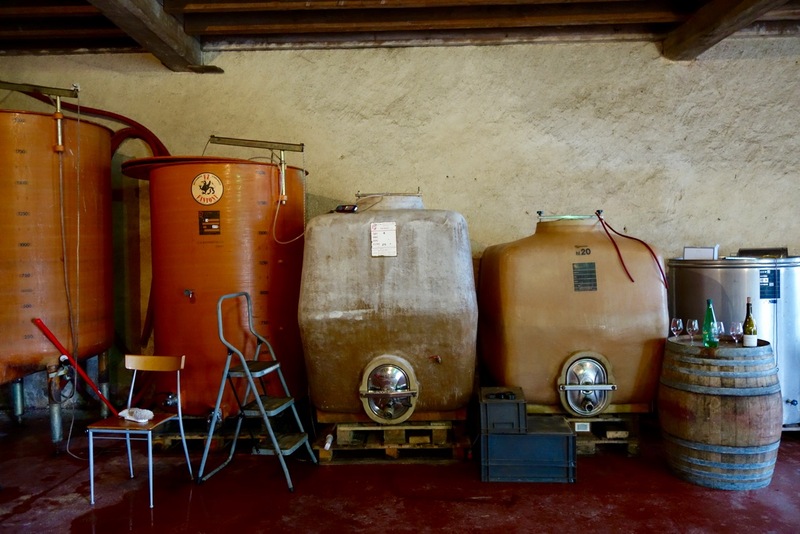 Paris also commercialises the nascent bottle production of his brother Jérôme, who is recovering from a battle with cancer. 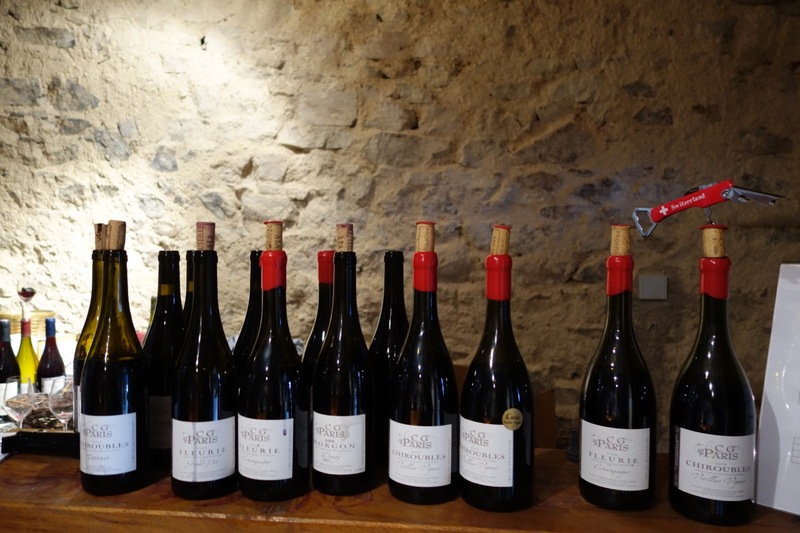 The bottles have very similar labels to the Gilles Paris wines, but are worth discussing in a separate post, particularly Jérôme's stunning Régnié. Gilles Paris isn't certified organic, but forgoes herbicide use on all but the steepest and most densely-planted parcels of Chiroubles. Now that his tenure as president of the Beaujolais Interprofession has ended (he was succeeded in 2016 by Morgon's Dominique Piron), he hopes to devote his time to full organic conversion. With the help of some investors, he's replanting sectors of his domaine to wide-spaced rows, to facilitate tractor work. Unfortunately, the second storm of 2016, that of late June, brought ruin to some of Paris' new plantings. They'd been plowed too late in the year, and the heavy rain brought the freshly turned earth right down the hill. Overlooking the "La Fontenelle" lieu-dit in February 2017. 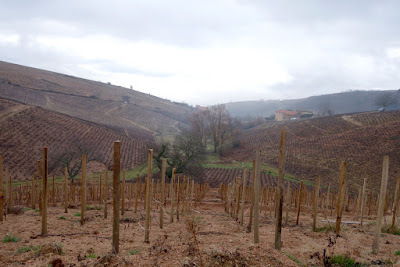 Episodes like this demonstrate why Chiroubles is arguably the most challenging terroir of the Beaujolais. Other sites have steep slopes and high vine density, of course. Erosion is also a problem on the Côte de Brouilly. But nowhere else in Beaujolais does one find Chiroubles' combination of steepness, storm exposure, and thin, sandy granite soils. I asked Paris what was to be done after a storm like that. He just shrugged and said he'd have to get excavators and earth-mover to bring the earth back up the hill. Then he'd salvage what vines remained and replant the rest. We found ourselves in Tokyo at the same time in 2015. Here we are at Ahiru Store. A few nice photos on the website of Paris' erstwhile Swedish importer, Dryckes-Butiken. I seem to recall they're no longer working together. One of Paris' bottles was the unwitting subject of some truly excruciating wine writing at Wine. All The Time. You could recruit for ISIS with writing like this: here is the decadent west. Had the opportunity to taste his wines at Glou in NYC last year, I believe Selection Massale imports them but limited quantities and distribution so essentially impossible to find in the former Soviet republic of PA. He was interesting to speak to, somehow my mangled French and his even more so English resulted in a somewhat mutual comprehension. Funny how the wines resemble in some fashion the spirit and personality of the vigneron. Just finished reading the posthumous just published Jim Harrison collection "A Really Big Lunch" and he has some interesting observations on wine and unlike the WATT review you cite, it is very well written.